Dare I say it, I might be one of the few Asian Americans who didn’t enjoy the movie Crazy Rich Asians as much as I had hoped I would. I had big expectations for the movie because not only did it have an all-Asian main cast with top-notch actors, but the story was taking place in Singapore! My mom is from Singapore, and when I was younger, my family and I used to visit every summer to see relatives, eat the delicious local food, and explore a mix of touristy and local spots. When the day finally came to see the movie with my friends, I indeed recognized some of the filming locations — Marina Bay Sands, Gardens by the Bay, and the Changi Airport. My eyes zeroed on the delicious local dishes Rachel and Nick ate at the hawker center. I heard bits and pieces of native slang, known as Singlish, and felt my heart warm as I pictured my mom chatting with her Singaporean friends during tea time. And yet, through the rest of the movie, I felt a way that I could only describe at the time as just plain weird. Was it just because I was a little pissed off that my friends and I were running late to the theater and missed a chunk of the beginning? Was it because the friend near me tried to talk during the movie (a pet peeve of mine), ruining the experience? To make things worse, that same friend had no reserves about the movie and absolutely loved it. She gushed that when she saw the character Rachel, it was as if she was seeing herself on a movie screen. I just couldn’t understand how she could identify with the movie while I didn’t, even though I had true ties to the country and experienced its diverse culture and humid weather on a deep level. Then, when the film finished and the ending credits were rolling, my friend joked loudly in our group conversation, “Caitlyn is a crazy rich Asian!” She hit a nerve, and I immediately blurted, “No I’m not!” That’s when I figured out the real reason why I didn’t enjoy the movie. Even though Kevin Kwan, the author of the novel which the movie is based on, says his real life had even crazier rich experiences, I couldn’t help but dislike the crazy rich characters in the movie. They focused on status and filled their “Bible studies” with gossip and worries about their investments. I saw them as a twisted version of my Singaporean cousins, who are Christians that have a good amount of money, but who are good-natured people. And as irrational as it was, the movie left me fearful that people who didn’t know better would assume that crazy rich Singaporeans are common, and that I am also crazy rich because my Singaporean mom moved overseas. What’s more, my mom ended up moving to live with my dad in a pretty expensive area in the U.S. We live in a nice neighborhood, and my sibling and I went to an expensive private high school and graduated from private colleges. We did get some financial aid in the form of merit scholarships, but our parents paid for the rest of the tuition, and we had no student loan debt. The part I hate most to admit is that my sibling and I were indeed spoiled when it came to money. We had issues with our dad, who was demanding, controlling, and had a scary temper. He was never good at apologizing, so after a fight, he would buy us something or just give us money. We would take whatever he gave us without a second thought, as if it could make up for everything. Our mom wasn’t very good at setting limits, either. When I graduated from college and eventually started an entry-level job, I experienced a huge reality check on my finances and attitude towards money. I knew I needed to make changes right away so I could work towards financial independence and ultimately respect myself as an individual. I started a budget and tracked my expenses to see what my particular spending weaknesses were. As a result, I’ve been able to cut out a lot of toxic, unnecessary spending and contribute monthly to an emergency fund and investment account, which I have been very proud of. In the midst of preparing these retorts, I realized that I was dealing with my financial insecurity by pointing fingers at those that seemed more spoiled than me. I have done so throughout the years, using my Singaporean cousins as reference points and targets — people I genuinely love, but also secretly judge for living with their parents as older adults in a three-story house, complete with two maids and a personal chauffeur. Whenever my mom criticized my spending habits and my behavior, I would always say to her, “At least I’m not like [insert cousin’s name]…” And then here I was, engaging in the same pattern but using fictional movie characters instead. Only later did I realize how ridiculously I was behaving. Such a comparison would not change the facts: I still live in a nice neighborhood, I still live with my parents, and I still have them as a safety net if I need it. Facing the reality of my privilege, instead of trying to downplay it using other people or movie caricatures, was the better thing to do for my relationships with people and with myself. Instead of unsuccessfully trying to hide my privilege, I see now that it is just best to focus on the other person in the conversation, listening and empathizing with their stories and struggles, finances and all. I also practice this now when interacting with my cousins, in person or over Facetime. Once I put finances aside and truly see them for the people they are, I remember that they are genuinely loving people that don’t have ill intentions and just care about spending family time with me whenever they can. In the end, my slightly sour experience watching Crazy Rich Asians was because it reminded me of my personal insecurities with finances and showed me that my game of comparing apples to bananas wasn’t helping myself or anyone. The movie is about a specific group of people in a specific country in Asia, so of course it won’t necessarily resonate with all Asians who watch it — even those who have been to that country quite a few times. Instead, I appreciate it for what it is: a romantic comedy that centers around family, identity, and money. I thank the producers for taking a risk to produce the film for the big theaters instead of taking up Netflix’s deal to produce it. 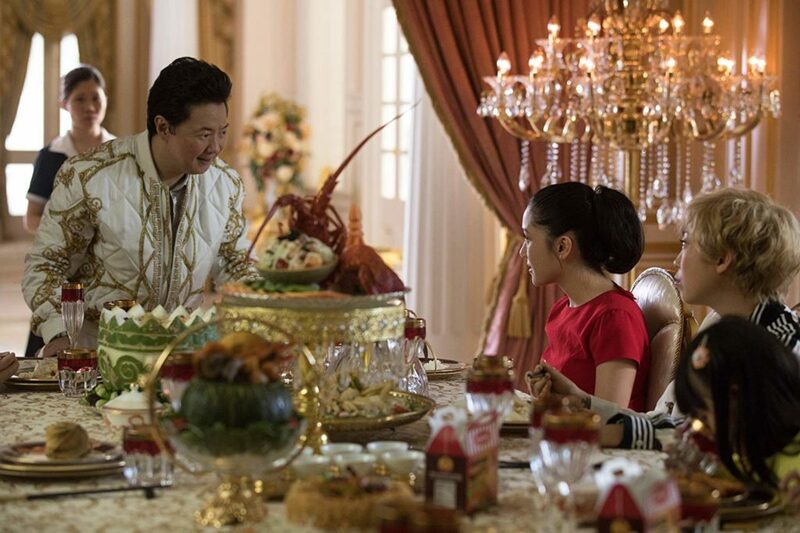 In today’s current political environment, Crazy Rich Asians made a huge, positive statement, showing that Asian voices deserve to be a part of Hollywood, and that Asians can be successful romantic leads. Here’s to having more Asian representation and Asian stories in entertainment and the media! Caitlyn is a twenty-something Asian American that likes to write and is still trying to figure out her personal finances. She thinks everyone has a story worth sharing. Stereotypes aside, she really likes drinking boba. She prefers to write under a pen name.